Will Oculus Open Its Store to All Once the Rift/Touch is Established? This is a speculative post and maybe wishful thinking on my part. Please keep your responses in line with the question asked. There are other threads about the rights and wrongs. Thanks. It's obvious Oculus are making sure it has exclusive software choices as an enticement for would be consumers to buy their product over the competition. Like it or not it's business and even if their stance loses them points with people who are not likely to buy their product anyway, I can imagine them simply saying behind closed doors "thems the breaks". Sure, it's aggressive but competition is competition and when you're in business against a competing product in an unknown field I don't think angelic thoughts about furthering a Utopian VR movement come into the equation or hold much weight from a business point of view. Blocking revive or at least attempting to do so makes sense because why would Oculus offer a competing brand the same benefits it has invested in and worked hard for its own product. However, based on their official comments made in the Tested Interview and now Lord Gaben chiming in that it is not Valve or HTC who are restricting access to Oculus Home, I feel a lot could be riding on Touch and the unique opportunities this can provide Team Oculus. It's easy to perhaps be an armchair business guru and suggest, "well if Vive owners could openly access the Oculus store then it's more money in the pocket of Oculus". This might be true on paper but on the other hand it could mean potential lost sales of the Rift hardware as consumers make the choice to buy one HMD over the other especially in these early days with shipping issues and trying to establish themselves. Right now, Vive's USP is having motion tracked controllers and roomscale and for Oculus, a more practical unit and a wider range of palatable well designed software. However, once Oculus does release Touch then the playing field is somewhat evened in terms of hardware design, although if Oculus continues to keep its storefront closed (or attempts to do so) to Vive owners then it maintains even more of an advantage there. What if though Touch games remain unique to the Rift much like Roomscale only games are to the Vive. Once there's enough unique enticements in this area perhaps then the Oculus store can adopt a more open door policy. Maybe this is what Oculus are hoping for over the longer term once the dust has settled with moving the product into stores and into peoples homes and Touch is widely available alongside plenty of showcase products. 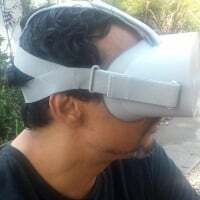 People are debating about a division across the PC platform with regards to software, but by design of both VR HMDs the divide is already there anyway and has been since day one. With Xbox and Playstation there's a universal control method with the Dual Shock controller and Xbox One Game Pad offering the same input design - developers can easily work with this. With Oculus and HTC both their input devices operate and function differently so it's not as clear cut. With that in mind then, perhaps the real issue is opening up the games which don't utilize the benefits of unique control devices and letting those particular games be open to all. Maybe this will happen at some point in the future and Vive owners get a section on the Oculus Store that works for them, but right now in these fledgling times it's not in the interests of Oculus as a business to do so and you can see clearly why there's a need for investment in getting exclusive content on its store front. Ask yourselves. Why would any company in business give away advantages it has to a competing product during its make or break period? Oculus is not a charity. From the outside looking in, we can only assume that when the advantage diminishes there will be changes - hence why there are timed exclusives. I believe Touch might be the catalyst for a shift in perspective as far as Oculus' software stance is concerned though. In other news Phil Spencer Head of Xbox has said that Microsoft will start selling some of its games outside of the Windows Store. EDIT: These are the kind of long winded posts you make whilst waiting for deliveries. Not going to go on and repeat myself again, other than to say...... I hope so. I can imagine Oculus making sure that every feature of Touch gets taken advantage of in every game to try to break parity between Touch and the Vive Wands. ...that being said, if they do open up their store to the Vive, I hope someone figures out how to add Touch Support for the Vive. That could be profitable. Hard to say for sure, but it will at least be more likely at that point. IF they do, they should also see about matching Steam on the whole "buy a game here, get a key for Oculus Home too" thing. I don't know WHO is responsible for the current arrangement (I would think the developers themselves, right?) or why it only goes one-way currently, but it's costing Oculus sales even from people who otherwise support the Oculus platform.